Events over the last several days reveal that the United States and Israel plan to conduct a false flag terror event to be blamed on Iran. The event will likely occur within the next six months and will result in an attack on Iran prior to the November election. 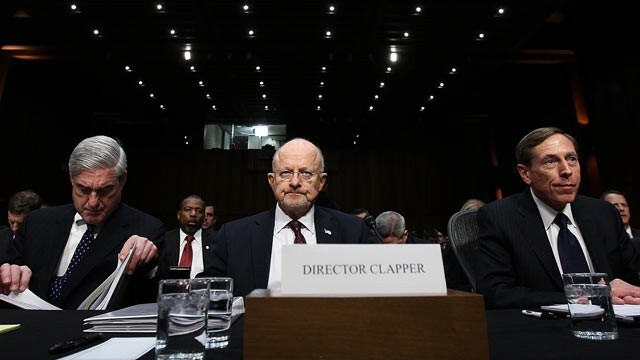 Obama’s intelligence chief, James Clapper (center), warned of Iranian terror attacks inside the United States. In January it was reported Mossad was behind the assassination of Iranian nuclear scientist Mostafa Ahmadi-Roshan. Cohen linked the alleged threat to the discredited plot to assassinate the Saudi ambassador in October. A court document in the case revealed that the FBI and the DEA concocted the plot as a sting operation and used failed used car salesman and alcoholic Mansour Arbabsiar as a patsy. Arbabsiar, who is from Iran, thought he was participating in a drug deal. Despite the fallacious nature of the plot, intelligence officials used it to hype the specter of Iranian terrorism that will likely result in a false flag operation used as a pretext to invade Iran. The Israeli bulletin also provides an excuse for the TSA to step-up intrusive pat-downs and demand travelers be subjected to dangerous naked body scanners at airports across the United States. “According to our evaluation there is a possibility that the forged passports will be used in order to pass as Israeli citizens at the security checks in Israel and around the world. Israeli security authorities may consider an Israeli citizenship as a [criterion] to proceed with a more lenient security check in secure sites such as airports, etc.,” the bulletin explains. The latest warning arrives two weeks after the Turkish newspaper Zaman reported that a cell of the Quds Unit of Iran’s Revolutionary Guard planned to attack U.S. embassy in Ankara and other targets across Turkey. • DEBKAfile reported earlier in the week that the United States will have 100,000 troops in the region by March. “Pentagon has been quietly massing troops and armaments on two islands located just south of the Strait of Hormuz, and within easy striking distance of Iran,” Mac Slavo wrote on January 31. • On Friday, the establishment media reported that Defense Secretary Leon Panetta said “there is a strong likelihood that Israel will strike Iran in April, May or June,” according to the Washington Post. The timeline is predicated on Iran entering an Israeli contrived “zone of immunity” in its unsubstantiated effort to build a nuclear bomb. • Iran has issued a number of threats in response to punitive oil and economic sanctions devised by the United States and Europe. On Friday, Iran’s Supreme Leader Ayatollah Ali Khamenei said in a nationally televised speech that his country will retaliate if Western nations impose crippling oil sanctions. In January, in response to European Union foreign ministers deciding to impose an oil embargo on the country, Iran vowed to shut down the Strait of Hormuz. • In December, in response to Sec. Def. Panetta’s not ruling out an attack, Iran announced it would hold a military exercise in the Persian Gulf. The 10 day exercise, dubbed “Velayat-e 90,” demonstrated that Iran has the ability to shut down the Strait of Hormuz. The U.S. further exacerbated the situation by sending the aircraft carrier USS John C. Stennis through the Strait of Hormuz while Iran was conducting its war game. • Russia and China have indicated that an attack on Iran would constitute an attack on their national security. “Iran is our close neighbor, just south of the Caucasus. Should anything happen to Iran, should Iran get drawn into any political or military hardships, this will be a direct threat to our national security,” said Dmitry Rogozin, Russia’s deputy prime minister and former envoy to NATO, in mid-January. In November, DEBKAfile said Obama will use war as a re-election tool. “President Barack Obama went on line to America’s senior allies, Britain, France, Germany, Italy, Israel and Saudi Arabia, with notice of his plan to attack Iran no later than September-October 2012 – unless Tehran halted its nuclear weaponization programs,” the neocon-connected subscriber-only publication predicted. Britain’s foreign secretary William Hague said in January his country has not ruled out military action against Iran. Britain had dispatched its “most formidable warship HMS Daring” to the Persian Gulf region prior to Hague’s remarks. In 2010, as Obama’s job rating began its descent into the abyss, former Clintonite and Democrat operative Mark Penn said Obama needs a domestic terror attack to regain his popularity. In July of that year, another former Clintonite, Robert Shapiro, said the only thing can preserve the Obama presidency is war. The late Washington Post columnist David Broder was more succinct. “With strong Republican support in Congress for challenging Iran’s ambition to become a nuclear power, he can spend much of 2011 and 2012 orchestrating a showdown with the mullahs. This will help him politically because the opposition party will be urging him on. And as tensions rise and we accelerate preparations for war, the economy will improve,” he wrote in late 2010. Tensions will undoubtedly rise if there is a terror attack inside the United States, either against an Israeli target or American one. It would provide an airtight excuse to unleash the awesome power of the U.S. military against Iran and cast Obama in the adulatory light all “war presidents” receive as the masses fall in line and wave their flags and cheer on “our boys” as they decimate another country and engage in yet another bloody massacre of innocents.